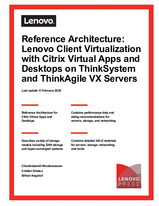 This document is the reference architecture (RA) for the Lenovo Client Virtualization (LCV) solution using Citrix XenDesktop on ThinkSystem servers. It should be read in conjunction with the LCV base reference architecture document. This RA describes the software components of the solution including Citrix XenDesktop and the different hypervisors. The RA shows different operational models using Lenovo ThinkSystem servers, networking and storage products with guidance on how to size each part of the solution. Some examples of different deployment models are provided together with an appendix containing the bill of materials. Click the Download PDF button to download the document.